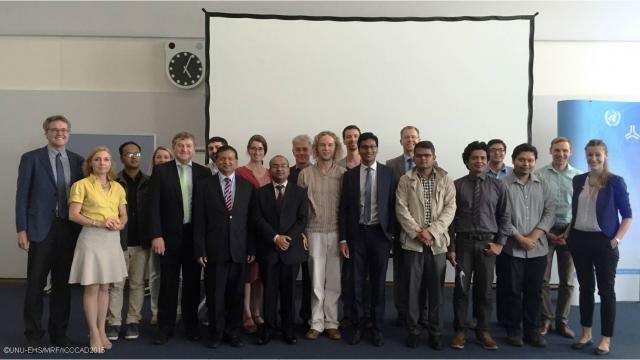 On 26 June a seminar was held at the UN Campus in Bonn (Germany) that brought together researchers and practitioners from Germany and Bangladesh to share ideas about and experiences with the concepts of Livelihood Resilience and Research to Action. The day started with introductions by Dr. Saleemul Huq (ICCCAD), Thomas Loster (MRF) Prof. Dr. Jakob Rhyner and Dr. Koko Warner (UNU-EHS), followed by a presentation about the Gibika Research to Action project by Senior Researcher Kees van der Geest and Project Manager Sonja Ayeb-Karlsson. The Gibika project is a partnership between the United Nations University Institute for Environment and Human Security (UNU-EHS), International Centre for Climate Change and Development (ICCCAD), and Munich Re-Foundation (MRF). It aims to advance the scientific understanding of livelihood resilience in Bangladesh, and to apply conclusions towards community-led solutions that improve the living conditions of vulnerable people. Gibika strives to not only protect lives, but also to protect livelihoods. The insights and findings generated through Gibika intend to influence national and international policy, related to livelihood resilience. Seven research sites (Dalbanga South, Mazer Char, Gabtola, Singpur, Babupur, Jamalpur, and Bhola Slum) were selected in 2013 that represent the wide range of livelihood systems experiencing extreme environmental adversity in the country. Cyclone related threats, riverbank erosion on the flood plains, and drought related threats in the dry lands were all identified as environmental stressors that impact the livelihoods of people living in the sites and throughout Bangladesh. The presentation included a photo film based on audio recorded during a ‘Livelihood History’ interview in one of the study sites. Interviews were conducted with residents that are living on the frontline of natural disasters such as cyclones. The photo film gave the audience an empathetic view of the hard choices residents have to make when choosing to either leave their homes and source of income OR evacuate to the cyclone shelter. There may be undesirable implications of labeling communities as ‘resilient’, as this may lead to a perception that they no longer need support. A focus on resilience can lead to losing sight of the root causes of vulnerability, such as inequality, and this should be avoided. Costal Vulnerability due to Sea-level rise Hazards in the Bangladesh, Delta (BAND-AID) Presented by: Roelof Rietbroek, Agricultural Faculty, University of Bonn. The BAND-AID project uses advanced observation system based local sensors and satellites to study and determine causes of sea-level rise and land motion along with human interactions that governs coastal vulnerability in Bangladesh. Assessing Climate Resilience at multiple levels: a conceptual approach. ITT’s Activity in Bangladesh: Institute for Technology and Resources Management in the Tropic and Subtropics. The program ended with a closing address by the Head of Chancery and Counselor to the Bangladeshi Embassy in Germany from Bangladesh Mr. Mohammed Najmul Huda. The collaboration of Master’s students from Bangladesh and a wide representation from UNU as well as outside organizations fostered a cross-disciplinary and cross-cultural dialogue about current efforts and future plans for enhancing livelihood resilience. The intention is to turn this workshop into an annual event to further strengthen German-Bangladesh collaborations. Hosted annually, the Resilience Academy is meant to provide a platform for connecting communities of expertise (early phase practitioners, academics, and policy analysts), examining livelihood resilience in the face of local and regional environmental threats. The 2015 Resilience Academy will take place near Dhaka, Bangladesh from 6-12 September 2015. The theme for this year’s academy is: Enhancing resilience to minimize loss and damage – providing knowledge for the UNFCCC.